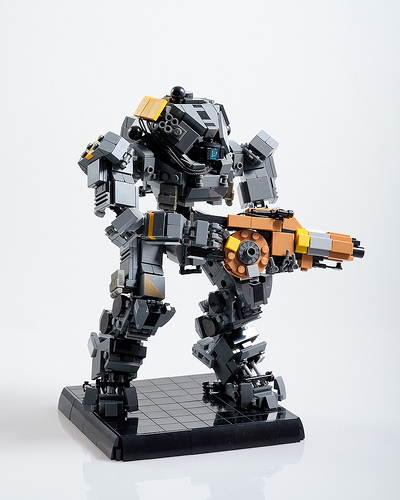 Marius Herrmann continues to impress with his LEGO Titanfall Titan builds. Adding to a series started by Titanfall’s Stryder and the sequel’s Ronin are Ion and Northstar. First, let’s highlight Ion, a Titan specializing in distributing power to various laser abilities. Marius has built mostly lightweight Titan frames in the past, but his skills work well with a slightly more armored mech. What really caught my eye on Ion is the perfect color choices for the Splitter Rifle. Equally impressive is Marius’s model of my most played Titan frame in Titanfall 2, the hovering railgun sniper Northstar. The array of massive jump-jets, the spherical sensor package, and the rungs on each leg are my favorite details on this Titan build.